I like to switch up my tech accessories every season or so. As I am not one for having the same things as everyone else, I wanted to design my own case. I came across CaseApp, a website that specializes in phone cases, computer and iPad skins for a variety of devices. I spent some time going through travel photos to choose my fave's that I wouldn't get tired of, edited them to be predominately grey scaled (to fit my monochromatic aesthetic) and match my other devices. 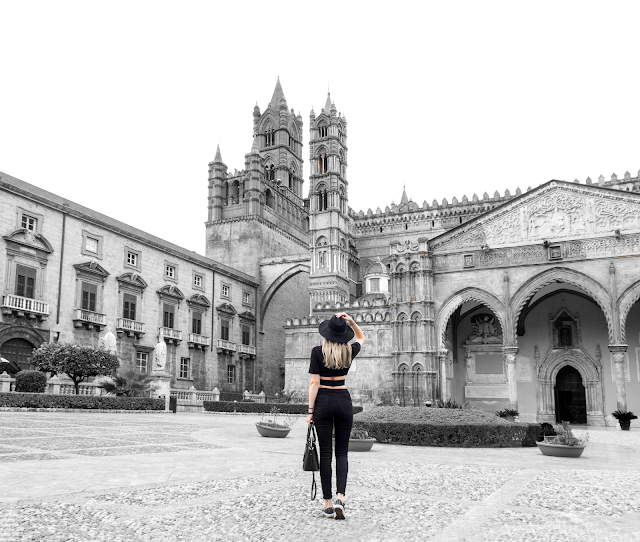 I found this photo from my recent trip to Palermo, Italy and thought it would make the perfect case as it merges travel/architecture and fashion all in one image. I love looking at the intricate buildings and depth of the photo. After spending the past few years in the U.K., I have become a tea addict. I drink approximately 2 cups of tea per day in the summer months, and 3-5 in the winter. I love all types of tea; Green, London Fog's, Latte's another other black tea based drinks that warm the soul. Over time this has stained my teeth. I have always had fairly white teeth, although, I have some staining closer to my gum line (tough to see in photos) that I wanted to get ride of. I have been on the search for an at home whitening system to even out the colour and brighten up my smile. As have a very full schedule, I need a product that is easy to use, doesn't make my teeth sensitive and of course has quick, effective results. When Smile Brilliant reached out to me, I knew I had to try out their whitening system.